When using an ordinary limited View Camera, how many times do you want to get into your picture just a little more than the Camera can get on a plate There was a time at the turn-of-the-20th century in which the market wasn't always clear, and this '5-F' is a really good example by a company - Multiscope & Film Co., Burlington, WI. USA - trying to hedge their bets. In this case it was for photographers who might want one camera to shoot normal and panoramic pictures. 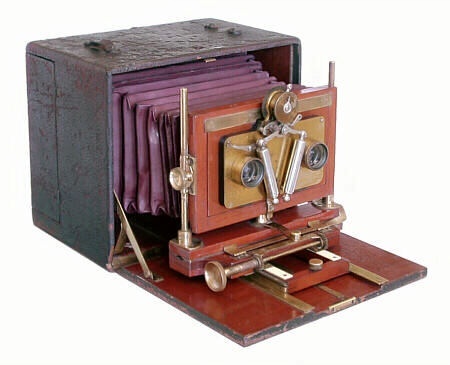 Various styles of panoramic cameras have been around since the late 1800s. The challenge was to make very wide pictures with no distortion. The Multiscope & Film Company (Burlington, WI., USA.) was best known for making box style panoramic cameras. Instead of a cumbersome design in which the camera turned on a tripod (ala the well known Cirkut cameras of the time), the company's Al-Vista models had a novel spring-driven (clockwork mechanized) swinging lens that could take in nearly 180 degrees. Exposures were regulated by the speed of the lens swing; and a spinning fan acted as a retarder. The bigger the fan the slower the lens swung. 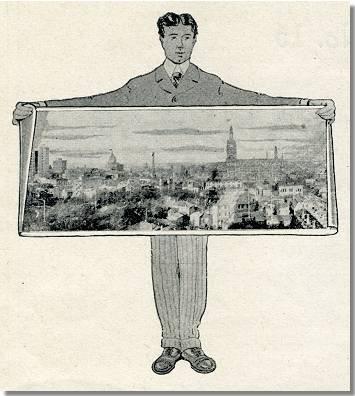 "For the tourist, and especially the foreign traveler, etc., this outfit meets the universal demand, as with both plates and films of standard sizes on hand, the operator is equipped with the equivalent of an assortment of Cameras, and is prepared with less than 10 lbs. of apparatus to do work of any kind-panoramic, view, or portrait. It is MANY Cameras in ONE and but ONE in many." Al-Vista No.5-F shown with 4x5 and panoramic faces and cloth case with retarding fans. The Camera As far as specifications, depending on the speed of the lens rotation the equivalent shutter speed was from 1/100 sec to 2 seconds. Focal length of the panoramic lens is 5-1/8" while the rectilinear lens was 6-1/4". The rectilinear lens was standard but for an extra $35, the 5F could be fitted with an f6.8 anastigmat lens. It was an expensive camera in 1908 costing $45 ($80 with the anastigmat grade lens). This equates to $1,132 or $2,013 in 2012 dollars! Given that the camera was sold for nearly 10 years, there must not have been much "universal demand" because only a few of these in any condition are known to exist.